Used GE Prospeed I For Sale. Refurbished, Pre-Owned & Reconditioned CT Scanners at Reasonable Prices. Used and Refurbished Radiology Equipment and X-Ray Equipment, Used and Refurbished Diagnostic Imaging Equipment, Used Cath Labs, Used C-Arms, Used MRI Systems, Used CT Scanners, Used PET Scanners, Used Nuclear Medicine Equipment, Used Mammography Equipment, Used Fluroscopy Equipment and Used Cardiology Equipment. 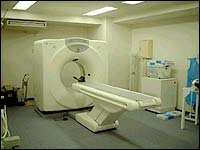 Description: GE CT MODEL PROSPEED I SERIES - Year 1995. Spiral/Helical 1 Second CT Scanner. X-Ray tube with +/- 25,000 slices new in 2002. Gantry rotations 2.8 million. Options include 3D imaging, Optical disk, Software 6.03 Version.